Welcome to Cruz Norwegian Forest Cats. 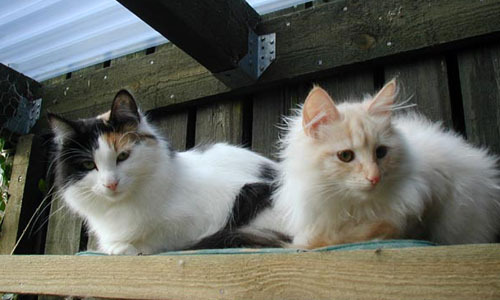 Our small cattery consists of three Norwegian Forest Cats and a domestic cat. They all have a wonderful temperament and are neither afraid of vacuum cleaners nor any other noisy equipment. They go all over the house and have access to a large run. Our cats like guests - especially Sofus will do anything to get their attention. The name of our cattery is called after our favourite star the "Southern Cross" ("Cruz del Sur" in Spanish), which is found in the southern hemisphere.